Whenever I cook, I try my best to source for ingredients which boost the health of my love ones. I try to keep everything as natural as possible and yet delicious. 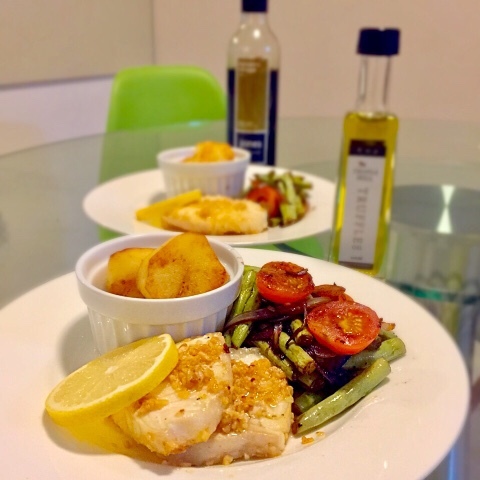 Today, I am sharing anti-inflammatory cod, garlic (a natural antibiotic) and balsamic vinegar which aids digestion. A wonderful mentor, colleague, neighbour ,passed me a recipe for cooking delicious potatoes. I love easy recipes and I could not wait to pair the recipe with my favourite protein and vegetables. The most delicious potatoes in the world are the ones with their sides slightly crisped and browned. Somehow, the heat from the pan releases the awesome fragrance of potatoes. It is very easy to prepare at home yet I have never thought of it. Firstly, I sliced the potatoes into squares of less than 1 cm thick. I cooked them in boiling water and dried them with a kitchen towel. Tip - Do not overcook it so that they do not become meshy when I fry them. I heated the pan and placed my cooked potatoes. I fried them until the two sides turned golden brown. It would taste gorgeous. Next, I switched off the stove and drizzled Truffle Oil onto the potatoes. Tip - Do not cook potatoes with the truffle oil because the flavours will evaporate. I stumbled upon this recipe through trial and error. Surprisingly, the taste was balanced and it is a good complement to most western food. I heated the pan and stir-fried some sliced onions until the aroma wafted in the kitchen. Next, I added the long beans, cherry tomatoes and drizzled some fish sauce over it. Once they were cooked, I lowered the fire to the minimum and added balsamic vinegar. Tip: It is important that the stove is on low heat because we do not want to destroy the wonderful nutrients in the vinegar. Try to adjust the amount of vinegar to your liking because it is sourish. I suggest starting with a small amount and adjust from there. The end product resembles the sourish salty long beans from Kenny Rogers. Personally, I do not like to cook cod fish with too much additional flavours because it would overpower the natural sweetness of the fish. A little lemon and some salt would bring out the awesome flavours from the cod fish. I marinated the cod fish with some salt. I heated the pan and fried some chopped garlic. Tip - Whenever, we want to bring out shine in garlic, we need to ensure that the stove is turned to low heat. Otherwise, it will taste bitter. I baked the marinated cod fish in an oven toaster, squeezed a small amount of lemon juice and drizzled some golden crispy garlic on it. Enjoy! 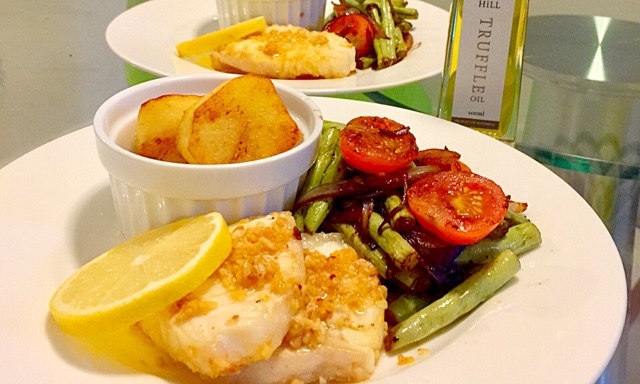 Leave your comments for more ideas on how to cook potatoes and cod fish!